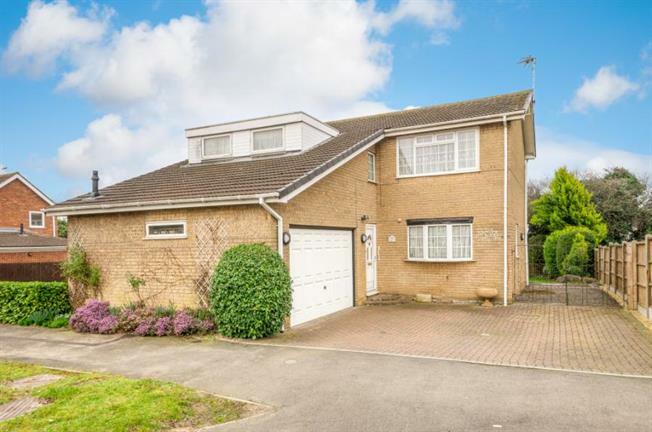 4 Bedroom Detached House For Sale in Milton Keynes for £500,000. Located in a fantastic position on one of Bletchley's most sought after roads is this spacious four bedroom detached property. On entering the property you are greeted to an entrance hall with open staircase and access to a downstairs cloakroom. The kitchen has a high and low level units with integrated dishwasher, hob, oven and fridge plus space for a washing machine. The lounge is bright with patio doors to the garden and door leading to the study which has ample storage. The archway takes you through to the dining room which again is lovely and bright and has a serving hatch from the kitchen. Downstairs is completed with a beautiful conservatory with views over the garden. Upstairs are four double bedrooms with en suite to the master bedroom and a family bathroom. Outside the front has off road parking for several vehicles and an integral double garage. The South facing rear garden is beautifully presented with patio area and lawn with a great amount of space to the side of the property that can either be used for parking or development (subject to planning). Positioned next to the green and within easy reach by road of either the M1 north and south or towards Oxford this four bedroom family home should at the top of your viewing list. The property in brief comprises: Entrance Hall, Cloakroom, Lounge, Dining Room, Kitchen, Study, Conservatory, Master Bedroom With En Suite, Three Further Double Bedrooms, Bathroom, Double Garage.